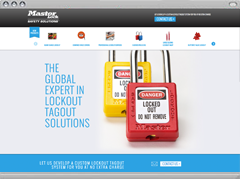 Master Lock® offers a complete line of Safety Lockout/Tagout products, to complement our full range of Safety Padlocks. The Master Lock® Safety products and services are designed to help you successfully develop and implement the best possible lockout/tagout system for your facility. The goal is for your facility to meet or surpass local LOTO requirements. You can rely on the Master Lock Safety Solutions™ lockout and tagout products to perform to the high standards you expect from Master Lock®. Master Lock Safety Micro Site gathers the latest and innovative safety solutions!